Uh-oh! Verizon NY's Local Service Network Expenses Were $9.8 Billion From 2009-2014, Not $200 Million. As Ricky Ricardo might say to Lucile Ball on the classic TV show I Love Lucy -- "Verizon's got a lot of explaining to do, Lucy..."
A union representing Verizon workers has called for investigations into whether the company is allowing its copper phone and DSL networks to deteriorate. "The Communications Workers of America (CWA) said it is sending letters to regulators in New York, New Jersey, Maryland, Delaware, Pennsylvania, Virginia, and Washington, DC. The union, which is trying to pressure Verizon while it negotiates a new contract, pointed to a Verizon statement that the telco has spent $200 million on its copper network since 2008. There is a lot more to investigate than just $200 million dollars. 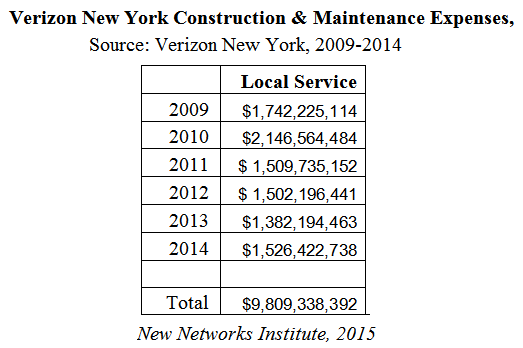 An upcoming report from New Networks Institute details that Verizon New York's construction and maintenance expenses for the "Local Service" networks were $9.8 billion dollars from 2009-2014. "Local Service" are the related revenues and expenses for the copper-based POTS, Plain Old Telephone Service. This means that Local Service, in just New York State, could have been overcharged $9.8 billion dollars from 2009-2014. It also means that the multiple rate increases since 2006 on regular local phone service, totaling about $750.00 a line, was probably just customer overcharging. And this also means that other lines of business have been heavily cross-subsidized on the backs of local phone service customers, including everyone from low income families or customers in rural areas, small businesses, to anyone who relies on the local copper wired networks. And this is only one of the questionable line item expenses. As we previously highlighted, Verizon has also been dumping its corporate expenses into Local Service; "Corporate Operations" expense is garbage pail for expensing almost anything.